Falling in love with a new home can be exhilarating. It can also be kind of scary, especially when you’re unsure of all the details. What if something goes wrong and you end up losing the deal? Sometimes it seams that how careful you are, some deal killers are unavoidable. Others may be preventable, so pay attention if you hope to keep your deal alive. One reason for a real estate contract to fall apart is that many buyers don't completely understand the mortgage process. You can get a loan pre approval, but it doesn’t actually guarantee that you will get the loan. After you receive your pre approval letter and decide to move forward with your purchase, the lender will open your file, give you a big list of paperwork to obtain, order appraisals, credit reports, verify your employment income, and more. Then your information is sent to the loan processor who reviews it all. The processor will then put together a package of all pertinent information and send it off to the underwriter. This is the point where many borrowers make a mistake. It’s crucial not to do anything - from application to closing - that could change your financial picture and ruin your approval. This means you can’t go shopping on credit for new appliances, furniture, etc. Try not to switch jobs, fall behind on your bills, co-sign a loan for anyone, or in any way reduce the income stated on your application. When you buy a home in a managed community that’s governed by a homeowners association (HOA), you'll be given paperwork to read and approve. 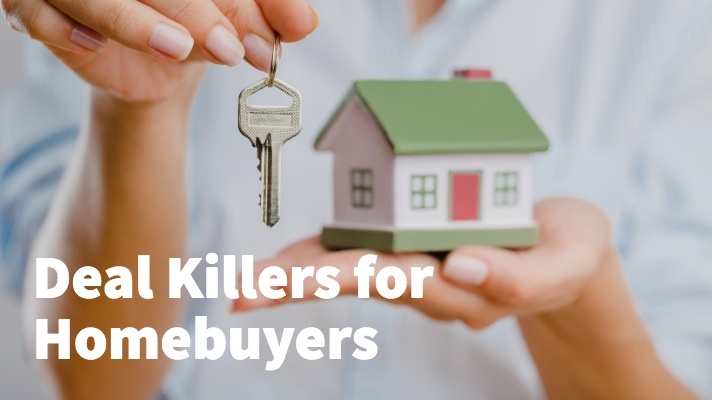 There can be deal killers included in the fine print, it's important to get to read through these docs immediately upon receipt of the documents. Look for information about liens against the property, litigation against the HOA, the builder, or developer; and other red flags in the HOA budget. Since these documents aren't easy to read and understand, you may want to have your attorney look them over on your behalf. All homes (even new construction homes) may have problems. Going into the buying process and not fully understanding this can cause a failed real estate deal. I recommend finding a home that has a few small, easy-to-fix problems, if any at all. When considering making an offer, don’t worry about the loose doorknob but negotiate when it comes to water damage or worse. If it’s a buyer's market, you may get away with minor demands. However, in a seller's market, there is may be a cleaner offer right behind yours. The real estate industry does a good job of reminding homebuyers that they need a down payment - usually from 3 percent to 20 percent of the loan amount. What they often fail to inform real estate consumers about are the loan's closing costs - the money you will be required to pay before the house is yours. This is most likely because closing costs are a little harder to pin down. They vary and depend on the type of loan, the amount of the down payment, and a host of other factors. Unfortunately, this lack of information frequently causes real estate deals to disintegrate. To avoid this problem, pay attention to all communications from your lender. Just before closing you will receive the "Closing Disclosure," which is quite similar to the estimate, but these figures are final. Again, review the "Cash to Close" figure. Contact me for more information!